We turned left off Nicholson Street into Gertrude Street, and headed into Fitzroy. These days Fitzroy is known as one of the world’s hipster capitals, a national centre for beards, tattoos and retro attire, full of cafes where you can get your 100 per cent vegan, cruelty-free chai latte, and salons offering alternative nail art. For the suburban explorer it’s also a place rich in old bluestone laneways and cottages, street art, intriguing buildings and ghostsigns. This post focusses on three sites, each pointing to a different aspect of the suburb’s history. The first sign is a few doors along Gertrude Street, at the entrance of a cafe at number 13. Unusually for ghostsigns, it appears not on the wall but beneath your feet, telling you that this was once the premises of C.W. Pugh, optician. The marble mosaic is well preserved and still quite beautiful with its simple, unornamental, sans serif lettering. That capital G in Pugh’s name looks very odd – as if it was a C with a little tail added as an afterthought. I don’t know how much a mosaic like this would cost but I suspect it would be more expensive than a simple painted sign, so Mr Pugh was making a statement about the hoped-for prestige and permanence of his business. I was intrigued to know when this sign might have been created, so I consulted Sands & McDougall’s street directories. During the early 1890s C.W. Pugh, optician, occupied a place a little further down, at number 19 Gertrude Street; he moved into number 13 in 1898, and stayed there until 1908, after which another optician, Ernest MacFarlane, took over the shop – but didn’t remove his predecessor’s name, which has remained for more than a century after the man himself departed. 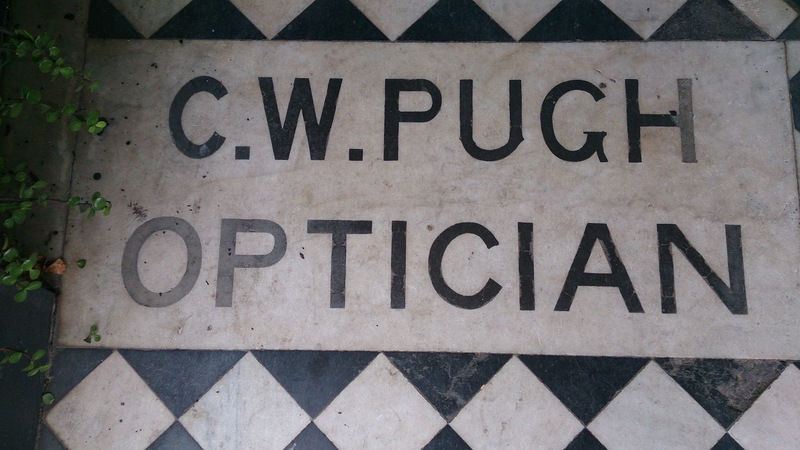 Mr C. W. Pugh was a high-end optician, as his sign suggests. After all, he was at the fancy end of Gertrude Street, not far from the Exhibition Building. In 1898 and 1899 he placed advertisements in Sands & McDougall emphasising his elite clientele. Lord Brassey, Pugh’s most celebrated client, was an English lord who was governor of Victoria from 1895 to 1900. The Australian Dictionary of Biography damns his career with faint praise as ‘creditable but undistinguished’. But at least he had a good pair of specs. C.W. Pugh’s occupancy was not particularly long: only ten years. His successor, E.J. MacFarlane, was much more long-standing. As late as 1974 – the last year that Sands & McDougall was printed, or at least the latest I could find – the shop at 13 Gertrude Street was still occupied by E.J. 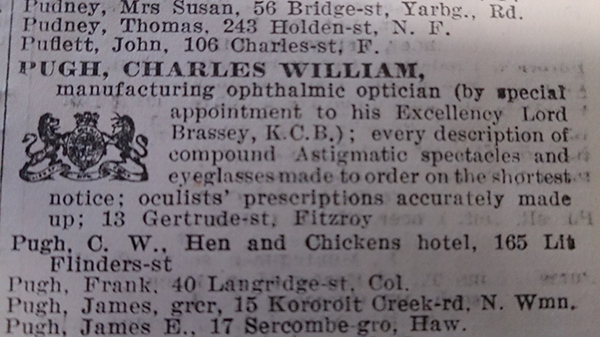 MacFarlane & Sons, opticians. I’m glad that they never decided to remove C.W. Pugh’s mosaic. If C.W. was hobnobbing with the ruling classes he was pretty unusual in Fitzroy, which has been a working class suburb for most of its history. This is evident from the number of industrial premises that can still be seen around the suburb, although many of them have been converted to other uses. From Gertrude Street I took a left up Fitzroy Street, where you can find many traces of the past. This ghostsign appears on a brick building, a former polish factory. The lettering is formed out of detailed concrete. 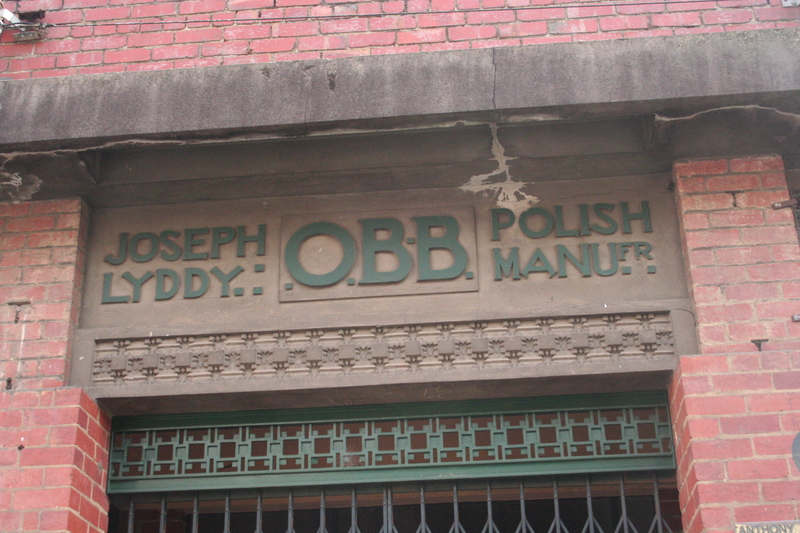 Joseph Lyddy was a manufacturer of polish for saddles and boots: the brand was associated with Cobb and Co coaches, provided polish to the Australian Light Horse Brigade during World War I, and apparently the name still exists today, though the company was taken over some years ago. The letters ‘O.B.B’ stand for the product’s slogan, ‘oily, black, and brilliant’, which must have been so well known that it could be abbreviated. This factory was designed in the 1920s by Eric Nicholls, an architect in the office of Walter Burley Griffin, the American modernist who created a number of great buildings in Melbourne (I wrote about one of them, Newman College, in an earlier post.) This factory is a significant example of modernist design in the industrial sphere, and the building is heritage listed. Next door to Lyddys is another industrial building, J. Barnett’s clothing factory, which is now apartments. I think I can make out the words ‘Christian Endeavour’ very faintly at the top of this ghostsign. I don’t know who you could claim the reward from these days, but in any case there has been a more spectacular and surreal addition to the wall. The No scribbling sign as it was before it was tagged. Thanks to Mike Alexander. The wall of Independent Hall, complete with surreal giraffe mural. 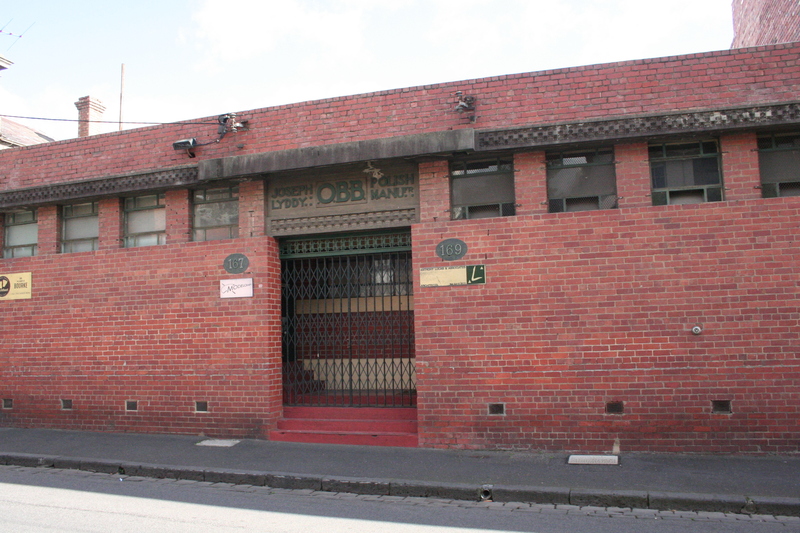 The first mention of the Independent Hall (Fitzroy Mission) in Sands & McDougall was in 1908, at the same time as Mr Pugh was running his ritzy optician’s business around the corner on Gertrude Street. If the ghostsign top right does indeed read Christian Endeavour, it’s possible the hall was associated with the youth movement of that name that was active in Melbourne in the early 20th century. However, by 1942 the hall was listed as vacant in Sands & McDougall. This article, unearthed by current owner Mike Alexander, gives an insight into life at the Mission. Sister Maude sounds like a good sort who was doing her best. 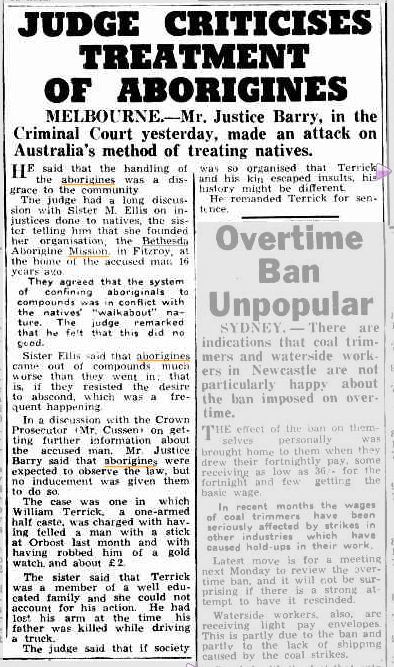 I came across another item in a newspaper of 1951 about William Terrick, an Aboriginal man. Sister Maude was there to speak on his behalf in court. By the mid-1950s the Bethesda Mission was no longer at the premises, and according to Sands & McDougall the hall was used for storage. The current owner tells me that the place was sold and converted into a private residence in 1973. Since then it has caught the eye of film and TV producers, and used as a location for several films and the Jack Irish drama series. (Well spotted, Stefan Schutt!) This photo shows Guy Pearce bursting out of the door of Independent Hall. 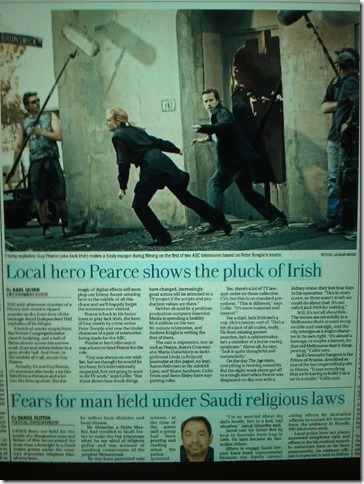 (‘Local hero Pearce shows the pluck of Irish’, The Age/Sydney Morning Herald 30 November 2011). Jack Irish and his friends are fond of lamenting how the Fitzroy of old has been swept away by gentrification, but today you can still find countless traces pointing back to the suburb’s fascinating past. Thanks to Mike Alexander for information and additional photos of Independent Hall. Like Melbourne Circle on Facebook. Suggestions for places to walk/visit? Please leave a comment or email me. Thank you for illuminating the traces of Fitzroy’s past. Three diverse and fascinating stories. My pleasure Nathan, thanks for reading. Good ghost (sign) spotting – a great post as always. Love the No Scribbling! 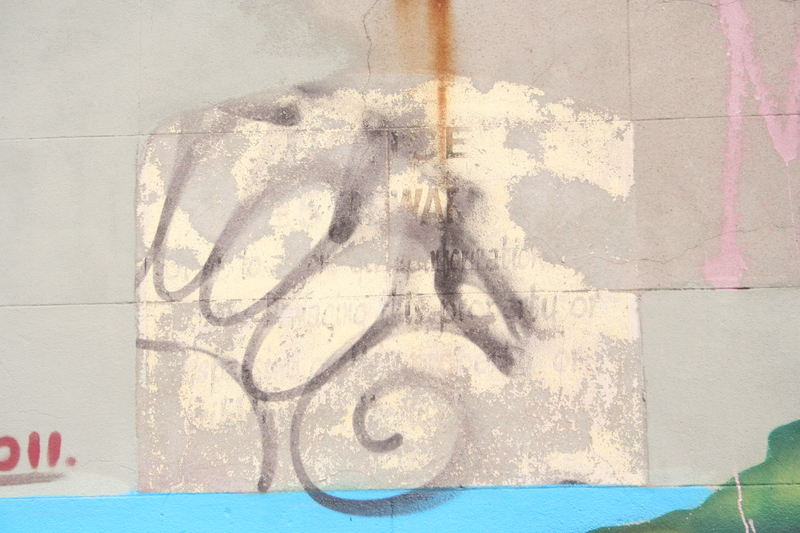 Thanks Vanessa – I reckon that No Scribbling sign was practically an invitation to scribble! Joseph Lyddy Dubbin (Neutral) 125g NET has always been good for maintaining and polishing Australian rules footballs -especially those in my shed, made by Sherrin. Glad to hear the tradition lives on, thanks Vin. Hi, when you were heading east on Gertrude you could have done a right at Brunswick St and at 38-40 Brunswick Street found the Former Melbourne Veterinary College – which has across the facade “Hospital for Horses, Dogs, etc”. I used to live near Liddys factory – always wondered what the OBB stood for. Good one Nick, Joseph Liddy also made waxes and polishes for the very many boot factories that were located through out Fitzroy and Collingwood but they had a difficult time competing with BOSTIC the chemical division of the British United Shoe Machinery Co. Consequently they never expanded their business in relation to the quality of their products, good to see they are still in production. Great work Nick, I posted this on instagram, and couldnt find out much about it, but I didnt try too hard. I can say that with my architectural eye however that it looks like it was made out of two little terrace houses, exactly like the ones next door, with simple gothic window frames inserted into the rectangular spaces, and a nice gothic door created (the garage entry must date from its storage or house period). 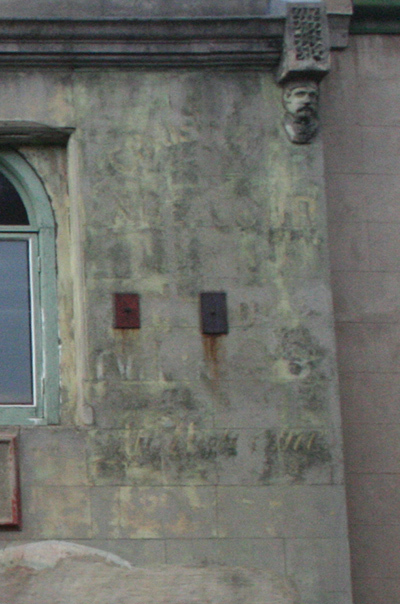 From your great photo, it looks like there are also filled in doors / windows at ground level. The most amazing thing is that it, and the houses next door, are some of the few survivors of early, very cheaply built, low rent fitzroy, when many of the similar houses around it have been swept away by housing commission clearances, car parks and the like since the 50s. Thanks heritagepoliceman, and yes you’re right – it was originally two houses, converted into a hall around 1908. I agree, it’s great that it survived when so much else was destroyed.